Five people were displaced in a 3-alarm fire in Woburn, Massachusetts, but Julie Centeno's wedding dress and ring were saved. After Julie Centeno, her fiance and her upstairs neighbors got out of their burning Massachusetts home, her mind turned to her wedding dress. 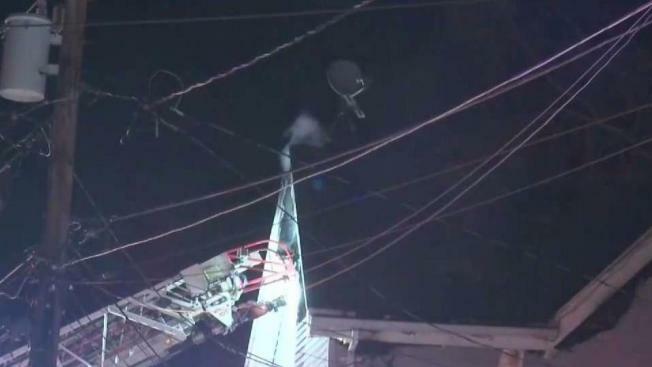 Fire crews knocked down a 3-alarm blaze Sunday evening on Hart Place in Woburn. Centeno, 25, her fiance, 29-year-old Curtis Wilson, and three other people got out of the building. "We didn't grab anything, we just grabbed our coats and walked out the door," Centeno said. After they were outside, firefighters asked if there were any essentials inside. "I'm like, 'Yes! My dress is in there, my diamond ring's in there," Centeno recalled. "Those were the two things I was really concerned with because it's hard to replace after finding the perfect diamond, the perfect dress." "We made a point to the guys going in, during the course of our job, to save her wedding dress and, more importantly, her diamond ring," Woburn Fire Chief Stephen Adgate said. "She's all set to go." Wilson said his main concern was making sure everyone was safe, and that their home and their things are replaceable. But he was grateful that firefighters were able to help his bride-to-be. "So happy that she was able to get her ring, and her dress, and I wasn't able to look at the dress, so we're still on good terms," he said with a smile. Wilson's mother says the couple will be getting married in November. According to Adgate, the American Red Cross of Massachusetts is assisting the residents displaced by the fire.